It goes without saying that I caught no carp! I honestly don't know why I bother even trying to catch carp when I stumble on them in unexpected places. When I find some they either disappear when I return with a rod or they simply ignore my bait. Then again I don't have the patience required to bait and wait. Nor the driving urge to actually catch carp. The end result of the challenge isn't interesting enough. Maybe if I stumble on a really big carp in an unexpected place I might see things differently, but the chances of that are slim to none. Truth be told I'd mostly gone out to play with a rod. I'd found an 11ft 1.75lb Torrix blank that I hadn't remembered ordering and as it's a blank I'd love to find a use for -it feels just right - I built it up intending to give it a whirl for bream or tench but haven't got round to it. When I blundered into these carp, which aren't big, I thought the rod would be ideal for some stalking - although blundering is a much more apt description of my approach! With summer in full swing the carp were cruising about just under the almost flat surface. A couple of fish actually came up and took a floater. That was before I could get them feeding confidently - and before my catapult broke. Not your simple snapped elastic which I could have sorted by cutting it back a bit, but something less instantly bodgeable. One of the plastic bits that connects elastic to pouch snapped. I tried chucking some bait out by hand but it dropped short. The ducks seemed happy about that. Today I had to buy both elastic and pouch because the plastic bits weren't available. Elastic and pouch wasn't much more than elastic alone, either. 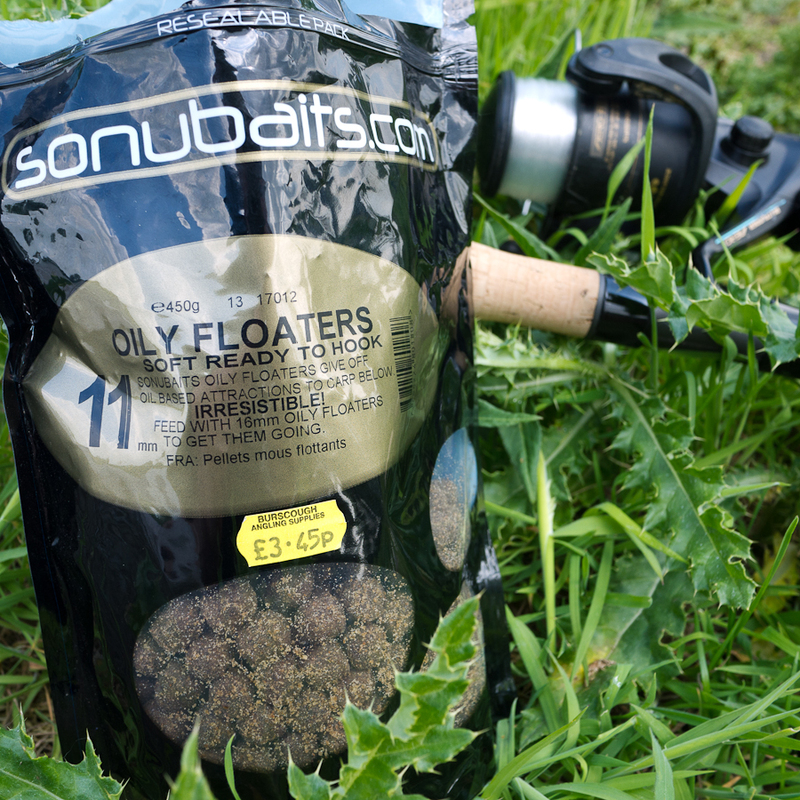 It's one of those moulded pouches from which I find my bait falls before I can fire it out. No doubt that's my poor technique. I also bought some maggots so I can do some proper fishing. The Torrix can stay home with the bloody floaters and the carp can please themselves.